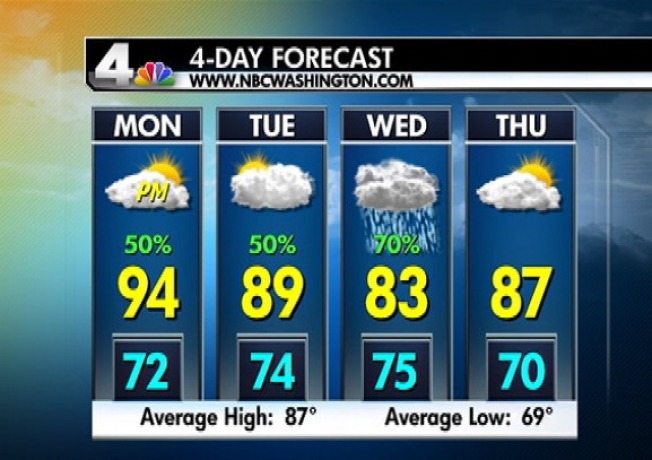 The D.C. area is under a severe thunderstorm watch until 10 p.m.
A cold front moving in to the area is bringing with it a slight risk of severe storms capable of producing damaging winds and hail, NBC4 meteorologist Tom Kierein reported. The main line of storms could pass through the D.C. area between 3:30 p.m. and 6 p.m. The watch covers D.C.; Anne Arundel, Prince George's, Howard, Montgomery, Carroll, Frederick, Washington, Calvert, Charles, St. Mary's and Baltimore counties in Maryland; and Spotsylvania, Arlington, Culpeper, Fairfax, Fauquier, Loudoun, Prince William and Stafford counties in Virginia. The D.C. area is still recovering from last week's damaging storms. Another weather system could bring a lot of rain Wednesday, which could mean possible flooding, Kierein said. News4's Darcy Spencer went to a spot hit hard twice Thursday in Gaithersburg, Md.